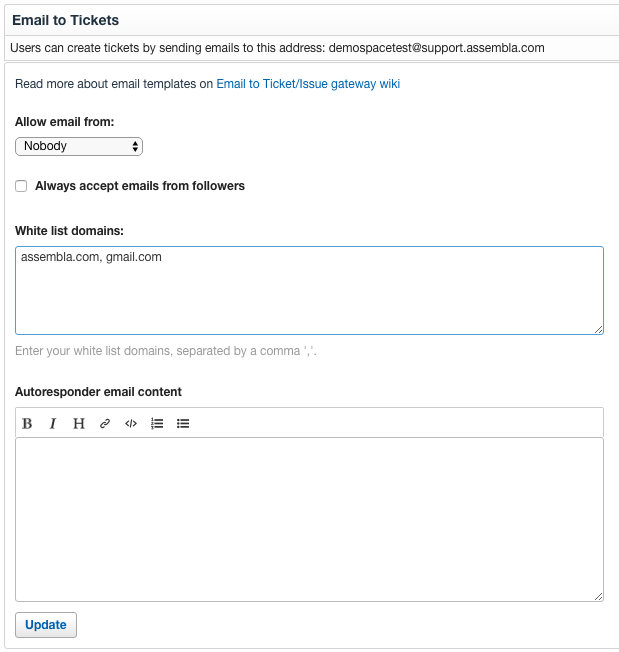 The Assembla Support tool allows non-Team members to submit tickets directly into a space via email or Web. 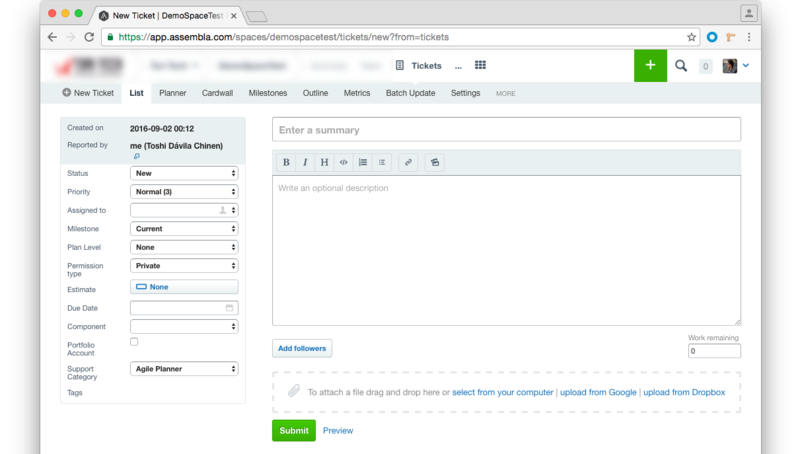 Whether your customers have an Assembla account or not, they can post support tickets in seconds. They can track the ticket as your developers work on it, and leave comments directly on the ticket or via email. By allowing your customers into the process without giving them accounts, you keep your space maximally efficient and secure. You can use custom settings and permissions to decide how involved you want your customers to be, and elect which privileges to give them. You can even write instructions and an email autoresponse for customers submitting tickets to make the experience as simple and straightforward as possible. You need to install the Support tool first. To do that please go to Your Space > Admin > Tools page and click on the "Add" button for the Support Tool. In both scenarios, you can restrict the access to other tools. You will learn how to do this in the next points. Before going forward on how to set up this scenario for your support tool, you must know that your customers will only be able to create support tickets via email and not from the assembla UI. If you are OK with this, then you can continue with all the steps. Go to Your Space > Admin and under Security box, find the option called "Non-member access" and change its value from None to View. It will prompt a warning window, just click on the "Make this Space Public" button. 2. Now, on the same page, click on the Security title, it will send you to the security page (.../my_space/admin/security). Scroll down at the bottom and you will find a table with all the installed tools and 3 columns. 3. Look for the "Public Access" column and change all the values to NONE for all the tools except for the Support Tool which will have EDIT permissions. Note: You can select the permissions you want on each tool. Just make sure to do it correctly, otherwise, your customers might have access to your data. 4. Click on the "Update Tool Permissions" button. 5. Now go to Support Tool > Settings and find the box called "Allow anonymous posting" and select the checkbox. Click on the Update button. Nobody: It means nobody will be able to send an email to your support tool. Some people use this setting along with the "White list domains" which will allow only the registered domains to send emails. Anyone: It means that anyone will be able to send an email to your support tool. Note: You can add an autoresponder email to your customers, which they will receive when they create a support ticket. 7. On the same box, select the option called "Always accept emails from followers". Finally Click on the "Update" button. 8.You are done! Now you just need the email address and you can find it on the same box mentioned in step 6. Now that you have setup your support tool, your customers are able now to email you to your_space@support.assembla.com and a support ticket will be created. Any comment you add on that support ticket, will send an email to your customer. If you want to learn more about how to use emails with assembla, please check this article: Create and edit tickets using email. On the "Add team members" box at the left, enter the email address of your customer and click on the search button. Add a message to let them know what this is about. Your customer will receive an email to join your space. He will be able to signup in 2 simple steps. On step 1: You don't change anything. Just leave it in NONE. On step 2: You are looking for Watcher instead of Public Access. On step 5 and forward: You can skip them if you want. 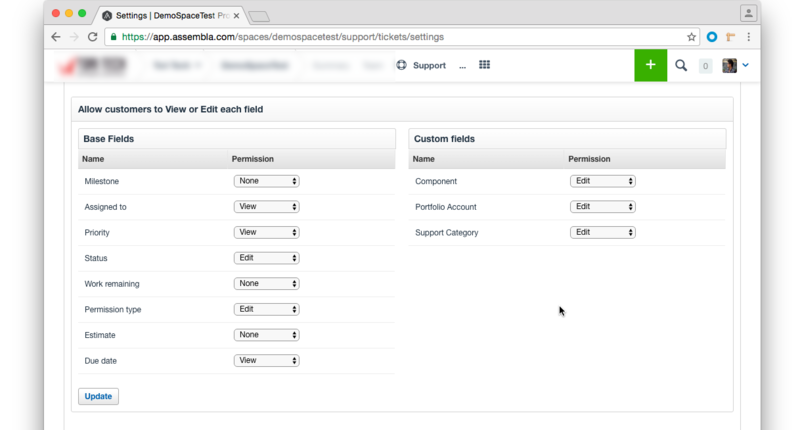 If you want to manage your support tickets in a more efficient way, you can create custom fields. To create a custom field please read our "Custom Fields" article. Going to the Tickets tool > Settings page. Select a default value for the fields you want. 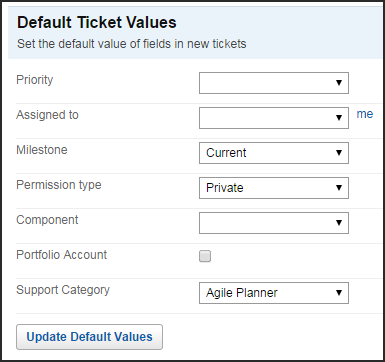 In the following example, a default value has been added for the "milestone", "permission type" and "support category" fields. You can choose what fields your customers can see and edit. To do this, just go to your Support tool > Settings > Allow customers to view or edit each field. You'll have the ability to hide (NONE) the fields or just make them visible (VIEW), or you can allow your customers to edit them (EDIT). None: The ticket will not be considered as support ticket and it won't be shown in the support tool. It will only be shown in the tickets tool. Private: The ticket will be considered as support ticket and only the people on the follower list will be able to access it from the support tool. Public: The ticket will be considered as support ticket and anyone will be able to access it from the support tool. Public tickets is the best option when a customer wants to open a support ticket and get everyone involved. For example the system is down, how to access to your site, etc.On the other hand, Private tickets is the best option if a customer wants to report an issue that involves private information. Scenario A: You don't want any public tickets - You just need to set NONE on the Permission type field and make sure the default value is not PUBLIC and all the support tickets will be created as private. 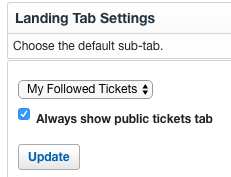 Scenario B: You want public tickets - You need to set EDIT on the Permission type field and add the "Public Tickets" tab on the Support Settings page. 1: Project URL and any other information that will help us troubleshoot.